Holidays bring up lots of emotions and if you are not aware of particularly the sad ones, this can be a difficult time of the year. If you grew up in a house where at least one of your parents was an alcoholic, you may be wondering to yourself “how am I going to survive the next month”? The internal conflict you are feeling is normal. As a child you were affected by your parent’s behaviors, your days were happy or sad depending on your parent’s mood. The same unpredictable behavior is what brings up the internal conflict now. Part of you is really looking forward to spending the time with your family. Seeing them around the Thanksgiving table, or opening up the gifts on Christmas day. If you are now a parent yourself, you probably want your kids to spend the time with their grandparents, cousins, and uncles. But the other part of you wants to run and hide. Just the thought of sitting around the table and watching your mom finish one glass after another is the image that took you across the country in the first place. This year, before you board the plane or pack your car, make yourself a commitment that this time things will be different. Following are some tools for you to use this holiday season. 1. Grab a pen and paper and write out a list of behaviors and events you experience when you are around your parents. 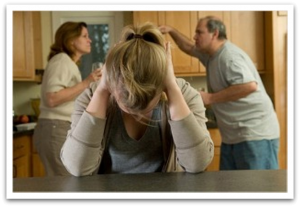 Write out what frustrates you about your alcoholic parent and what you appreciate about them. What you look forward to when you plan your trip home. What are your fears and what keeps you from visiting more often. Make this as personal as you can, no one has to see this list. 2. Take the above list and identify how you would like to spend your time with your family. Go ahead and dream, don’t think of any obstacles, this is your dream list. 3. Now take the above lists (#1 and #2) and identify what you are willing to put up with, and what are your non-negotiables. I.e., While you are staying with your parents, you will accept your mom’s drinking, however, you will not tolerate her drinking in front of your daughter. In order to compromise, you will accept her drinking only after your daughter’s bed-time. 4. Let your (alcoholic) parent know that you have something important to discuss with them prior to your visit. You may want to schedule a conversation to be sure that this discussion is not taking place when the parent is under influence. 5. Start the conversation by sharing your feelings – refer to #1 list. I.e. when you drink I feel sad and uncertain of what personality will come out that evening. Once you express your feelings, set the expectations of how you want this visit to be different. Express that you have done a lot of thinking and in order for you to take care of yourself (and your child) you need to ask for a favor. Then go on and express what are your needs. What your tolerables are and what are your non-negotiables. 6. Make a commitment with yourself (and your spouse if you are not traveling alone) that if these expectations are not met, you will leave. Make an alternative plan of where you can stay. 7. Forewarn your parents that if your request is not honored you will leave, as uncomfortable as it maybe for everyone. 8. If you are traveling with your spouse, discuss your exit plan before the trip and be specific of how you want to receive support from him. The more specific your conversation and preparation is, the more confident you will be during this trip. 9. If you are traveling alone, confide in a friend/sibling/relative and ask for support before you make the trip. Practice an exit plan with them and clarify what support will look like for you, so that they are prepared to provide you the kind of support you will need. 10. Now that you have communicated and prepped, ENJOY your time. Children of alcoholics exhibit symptoms of depression and anxiety more than children of non-alcoholics. You don’t have to be part of this statistic. Alina Steinberg Baugh is a Licensed Psychotherapist in San Francisco and Burlingame, California. She works with women and teen girls, specializing in issues around children of alcoholics, infertility, and body image/self esteem.